For group bookings, we require a deposit payment of 50% of the the stay payable one week prior to arrival. We would issue a bill payable through paypal. Welcome to Mai Pen Rai Bungalows, at Than Sadet Beach on the East Coast of Koh Phangan. Here the emphasis is on keeping in touch with the roots of nature around, and this can be seen in the design of the bungalows and in the restaurant itself. 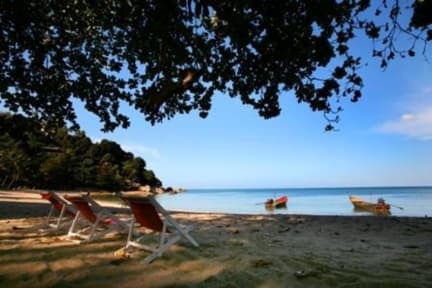 This is the kind of place for those wishing to be away from the commercialism of Koh Phangan, to enjoy the sanctuary of a peaceful and quiet beach resort and replenish ones spirit. At the beachfront restaurant the atmosphere is relaxed with good music, traditional Thai and Western Food. There is always an abundant supply of fresh seafood and daily specials often include freshly caught fish from around Than Sadet waters. Next to the restaurant is 'The Reggae Bar' as some call it; this is a mellow, un-pretentious and fun place to relax, especially in the evenings, surrounded by the sounds of the frogs and crickets, and a wonderful place to watch the stars. This is the place to soak up the presence of Than Sadet and to enjoy the spirit of the people and characters who visit this beautiful beach. Than Sadet beach is slightly off the beaten track, and commercial route of Koh Phangan, which adds to its charm. Here one is able to completely unwind and reenergize ones spirit, whether watching the sunrise in the morning or chilling out by one of the beautiful pools of the Than Sadet River. This is truly a paradise where nature lovers and artists from all walks of life can come together, and enjoy the peace and serenity of this unique corner of the world. 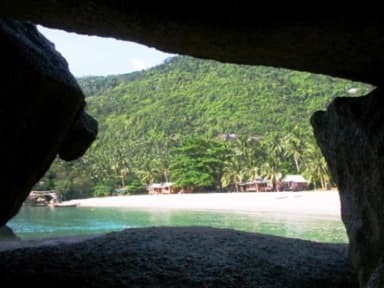 Due to the fast development of Koh Phangan, this really is a one of a kind place where the pace of life is still as it should be, and the feeling of the old Koh Phangan is still present in the atmosphere and feeling of this beach. Due to the remote situation of Than Sadet and the factor that it is in National Park territory, government electricity has not reached Than Sadet. This in fact adds to the charm of the place. Power is run by generator and is switched on from 11.00 am until 4.00 pm, and then again 6.00 pm until midnight. Satellite Broad band Internet and WIFI is available in the restaurant for a charge of 50 baht per day.